A Coarse Purple 100g Detailing Clay With Case which is perfect for removing heavy contamination from wheels, paint, or glass. This is a 100g bar of coarse detailing clay. 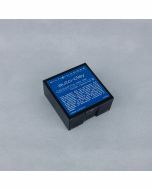 It’s supplied in a hard shell plastic case to keep your clay clean and free from contaminates. This clay bar would only be recommended for heavily contaminated paint or glass or wheels due to the coarse nature of the grade of the clay. How to use a clay bar. Claying or clay barring a car doesn't have to be complicated or difficult. A car only needs to be clay barred fully once or twice a year but obviously will be dependant on how often a car is used, how often it it washed, what kind of protection it has etc. The purpose of using clay bar on paintwork is to remove any bonded contaminates on top of the paint surface which hasn't been removed by the car washing stage or by the chemicals used for tar and fallout or iron removal. A clay bar removes these contaminants by basically sheering or shaving them from the top of the surface. Clay bar is most commonly used to remove overspray, tree sap, tar and industrial fallout. All of these types of contaminates can contribute to your paint feeling rough and dirty to the touch. Advantages of using clay bar include deep cleaning of your paintwork, giving your wax or sealant a clean surface to bond to, and even helping to restore the gloss and lustre of your paint finish. It's important to make sure the surface your working on is well lubricated to ensure the clar bay glides across the surface of the paint. You can find clay lubricants on the clays and lube page. If you find your self stuck and don't have any dedicated clay lube you can use a small amount of car shampoo in a spray bottle instead. Before you start ensure the car has been thoroughly washed and dried if possible. Separate a piece off the clay bar and work it in your hand until it's pliable and soft. Normally around 40 - 50g is a good size. Flatten this piece out until it is around 4-5mm thick and shaped like a round or oval disc. Spray the section you intend to work on liberally with your clay lubricant and simply slide the claybar across the surface back and forth with very light pressure. We would advise only working on a 1ft x 1ft section at a time. As you slide the clay bar on the surface you will feel the contaminants on the surface of the paint being picked up by the clay bar and as you complete each small area the clay will glide smoothly over the surface and when the surface feels completely smooth you can move on to the next section. It's a good idea to have a soft microfibre cloth at hand to wipe down any particularly heavily contaminated areas. Continue to inpect your clay bar after each small section to ensure it's not getting too badly contaminated. When the clay bar shows a layer of dirt on the surface, fold the clay eveningly in half to enclose the dirt within the center of the bar to reveal 2 fresh new sides. Make sure you only work with 1 side of the clay bar at a time. Do not be tempted to flip the clay over and use the opposite side. If at any stage of the process the claybar is dropped on the ground or becomes particularly heavily contaminated the bar should be discarded. Don't be tempted to keep using it as it may marr the paint surface leaving it dull and swirled. After using clay bar on a car you are ready to move onto the polishing stage. You may want to wipe the car down or give it a light rinse to remove any remaining clay lube or residue left on the paintwork. 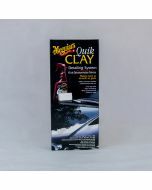 Clay bar are excellent for removing the scum or film on the surface of glass.